SHORE is our next performance installation, the third in our current trilogy of works that began withThe Thank-you Bar and Niicugni. It will premiere at Northrop Auditorium in Minneapolis in June 2014. SHORE will be equal parts volunteerism, storytelling, performance, and feasting. To celebrate the making of this work and Catalyst's 15 year anniversary we're throwing a party! Come celebrate with us on September 29th - get a sneak peek of SHORE, tour the new Northrop Theater, and help us raise funds for this project! 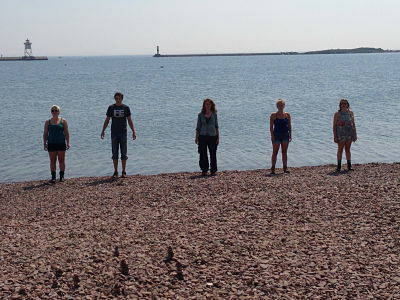 Our first residency for SHORE was in Grand Marais, Minnesota, on the North Shore of Lake Superior in early July. The perfect place to dive in. We collaborated with the local park board and garden club, weeding, picking up trash, planting bushes in Harbor Park, right on the shoreline in the heart of downtown Grand Marais. James set up our sound installation and people joined us for walking and singing scores on the beach. Thank you to everyone in Grand Marais who joined as participants, volunteers, and audience! More photos on our FB page and FLICKR. We'll continue work with an upcoming residency with performers Aretha Aoki and Krista Langberg, composers James Everest and Nona Marie Invie (Dark Dark Dark and Anonymous Choir); some Practice Potlucks; volunteer actions in Minneapolis; and some large cast and choir work down on the banks of the Mississippi River. I feel so lucky when projects like this come along. Last spring one of my favorite bands, the irresistibly irreverent, ALPHA CONSUMER, asked me to choreograph their music video: The Eat. Rock Music. Dancing in Bags. Good People. Yes Please. SPIN Magazine released it last week. Love it like I do? I just returned from an inspiring Creative Capital retreat with current and past grantees and colleagues. The work in the world right now is amazing. I came home energized! You can read about current fellows and our work here on the Creative Capital website and here on Hyperallergic. Thank you, Creative Capital, for funding and support! Julia Bither, who was our fantastic intern last year and who is now working with us had a goal of jumping into a lake everyday this summer. I'm not sure if she's done it - I'll ask her tomorrow when she comes over for work... But with a gorgeous goal like that, who really cares about the outcome? Thank you Julia, for joining Catalyst! We need to protect our wild salmon. The proposed Pebble Mine threatens the largest wild sockeye fishery in the world. 10 billion tons of toxic mine waste would devastate this fish, the streams, rivers, wetlands, the thousands- of-years-old harvest and subsistance by my Yup'ik relatives, and the livlihoods of commercial fishers. Help us. Did I mention Catalyst is 15 this year? How time has flown and how good it has been making dances for you.